In protest: too few nominations for Oppenheimer! I look back in… anger! 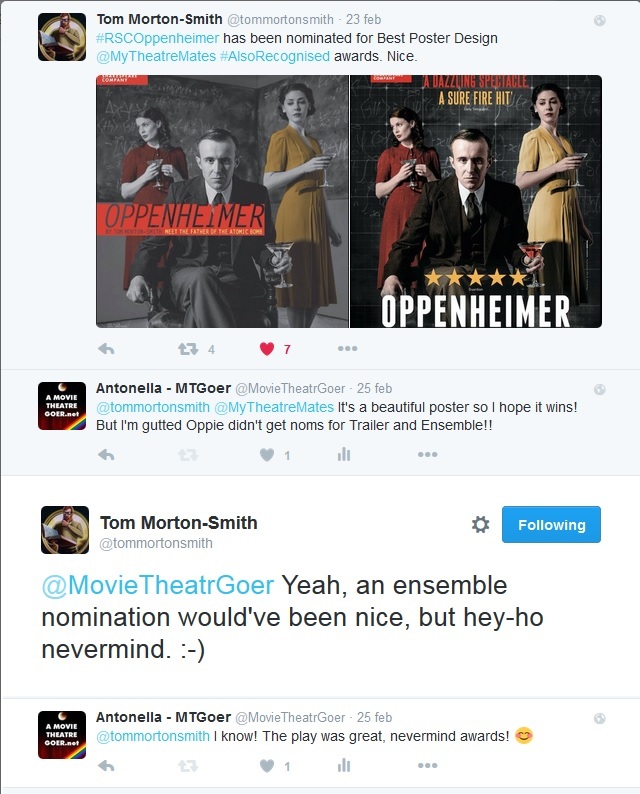 I can’t find an explanation on why Oppenheimer is not getting recognition from the theatreland: time goes by and some important awards on season 2015-2016, after just few months, seem to have forgotten how beautiful, gripping, entertaining and ridiculously well performed this play was, giving preference to latest productions and, even more irritating, to more famous – not necessarily more deserving – actors! Not talking about the fact that musicals seem to steal attention everywhere. I’m so disappointed that any other nomination for other good plays I saw last year didn’t take me at all and I know is not nice from me, I should be happy for them and support them all, but I can’t help it! I’m so so happy Catherine Steadman got her Olivier Awards nomination, of course! It’s amazing but I shouldn’t be surprised: she really deserved that! I know there were little chances that any of the other supporting actors could get a nomination, they were all at the same good level, so it would be hard to choose between them, but they could get one as Ensemble, at least! How could be possible they didn’t? No noms for Best New Play, Direction, Music, Sound, Set Design, Light Design either! I would give it a nom even for Choreography for the dynamic movements the cast made on stage, even if it wasn’t a ballet nor a musical! And Oppenheimer got very good 4* and 5* reviews from many important magazines and blogs and it’s a fact that it was requested by the audience of London, after the run in Stratford-Upon-Avon and was sold-out in several dates. Both the Trailers made as adv for the two cities would deserve an award, too, expecially the first one in black&white. Are theatrical awards’ juries blind or too posh to reward it, I wonder? But, even more absurd and unfair, the wonderful John Heffernan has been ignored for his performance as Robert J. Oppenheimer! He’s a performer of great sensitivity and dedication, he got the play on his shoulders, I’ve never seen an actor so taken by a role like him at the end of the play! He totally blew me away! What an amazing actor! Yesterday and even today, I read many tweets of other people disappointed by the lack of nominations for Oppenheimer and Heffernan, so I’m not the only one who’s gutted! and that those actors and creatives who worked in Oppenheimer will stay in the audience’s hearts forever (I suspect the cast itself had great fun doing it), and – again – I’m aware anyone can say that about their own favorite play or musical, but I’m still convinced this particular one should deserve awards like rain! I wouldn’t have seen this play four times in eight days, if I wasn’t totally taken by it! It never happened before and I will never regret it! You can read my review there. It’s a pity it wasn’t recorded for streaming or disks! And the wonderful Catherine Steadman has been nominated for Best Supporting Actress for her role of Jane Tatlock at the #OlivierAwards! http://www.olivierawards.com/nominations/view/item274545/best-actress-in-a-supporting-role/ – she deserves it, she made a terrific, moving performance! Fingers crossed for both the nominations! You can have your say writing me a comment below. « Save The Honest Actors’ Podcast!